Unlimited clockwise and anti-clockwise 360° rotatable. Operator can control the rotating speed. Oil flow control valve and motor protection mechanism applied. Enclosed check valve for safety operation. Specially designed big cylinder for more power. Specially designed swing bearing for durability. Wear resistant special solid steel(PT60 from POSCO) is used and no extra reinforcement is requirement. For loading scrap, garbage, demolition debris and waste paper. 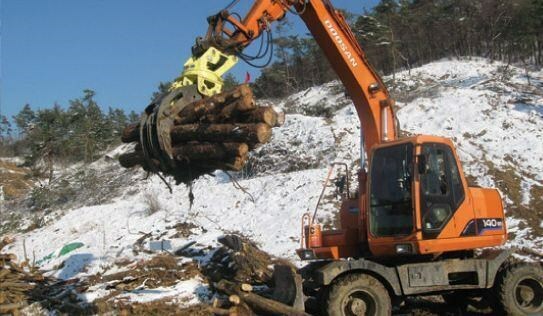 Contractors in Forestry, Recycling, Landscaping and General contracting all appreciate the versatility of DAEHAN's power rotating grapples for their various configurating options. Very Wide opening & very positive closing for small single log Various log handling as Timber, log, wood, etc. New type power 360° Rotating Grapple. 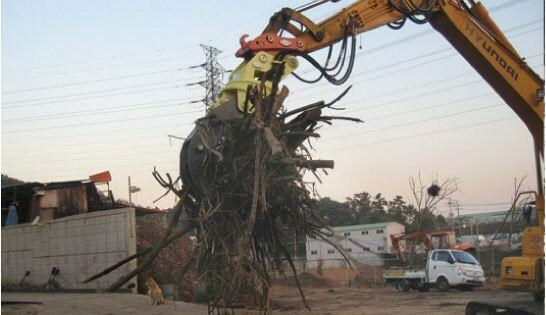 Minimized hydraulic trouble which may occur during rotating works. Oil flow control valve and motor protection mechanism applied. Specially designed swing bearing for durability and big cylinder for more power.